I can't believe how quickly my kids are growing-up! My youngest is turning four in just a couple of weeks and is definitely starting to assert his independence. Right now he is having a long debate with me about the reasons that he needs to have jam with a piece of gluten free bread. I must admit that the kid has a lot of willpower. With my children growing older I seem to have less and less time to spend on pretty much anything. Instead of getting my shower first thing in the morning like I used to, I am lucky to have one before going to bed. My time is more and more limited which means that I am relying on recipes that take little prep and cook time, especially on busy weekdays. That doesn't mean that I don't still love involving and delicious recipes, it just means that they are once a week instead of everyday. It also doesn't imply that I have given-up on big flavors and great food. There are some great recipes that take little time to make, but turn out as well as recipes that take three times as long. Recently, I tried a new recipe for Kung Pao Chicken from the October issue of the Food Network Magazine, which with 25 minutes of total time looked perfect for my active and busy household. This recipe has 12 ingredients. It takes a total of 25 minutes, all of which is active and makes 4 servings. I had no problems finding any of the ingredients at my local grocery store. Instead of using frozen stir-fry vegetables I chose to use fresh vegetables. The flavor of fresh vegetables is much better and I could control the exact type used. Since I don't eat gluten and most cheaper soy sauce has gluten as a main ingredient I used gluten free soy sauce instead. When I first stopped eating gluten I had no idea how many things use wheat as an ingredient, I've learned to be very vigilant with my label reading. Instead of chicken breast, I used chicken thighs. I prefer chicken thighs for flavor, they really are worth the extra amount of fat. Since I used fresh vegetables my total cooking time was increased. I let my dish cook for an additional 5 minutes after adding the sauce. Finally, I added a pinch of crushed red pepper to enhance the flavors. I followed the remainder of the recipe as written. My two boys really loved this recipe. I like that it took less than a half an hour start to finish. The fact that the recipe has 41 grams of protein is another great selling point. My two boys are both in growth spurts so high protein meals are essential. This recipe doesn't have traditional Kung Pao Chicken flavors, but would be a good dish for people that want a more mellow stir-fry. I would suggest increasing the ginger slightly if you want to add a larger flavor punch in addition to the addition of crushed red pepper. If you are expecting leftovers I would double this recipe. The dish made exactly enough for my family of four. If I made this recipe again I would double it to have lunch the next day. 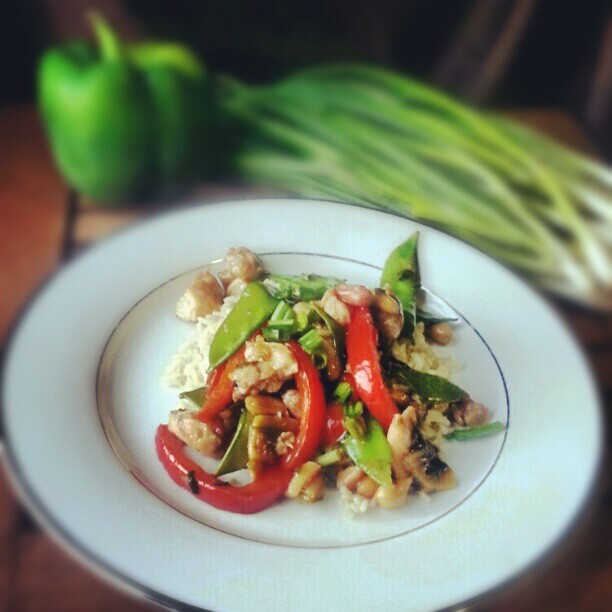 For the recipe go to Kung Pao Chicken. I love Kung Pao Chicken also :) There is lots of room for guests! Going over to sign up for your hop! Oh that look super yummy!!! Following you from the Hop! That's awesome! I must try it. Following from the Aloha Affair hop. It really is yummy :) Thanks for the follow, followed you back! Stop by again soon and find some new recipes to try!